Slot Games listed are King CashaLot , K9 Capers Slot , King Kong Slot from Playtech and Kings of Cash Slot from Microgaming. The Wild is King Kong himself and he substitutes for all other symbols to complete a winning line but only on reels 2,3 and 4.He does not substitute for the King Kong Logo symbol. The ‘King Kong Goes Ape’ feature triggers all the symbols on reel 3 to become wild symbols, and 3 scatter symbols triggers the ‘King Kong Smash Feature’ where the player gets to choose planes for King Kong to knock out of the sky. 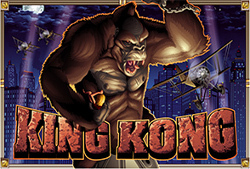 Each plane that King Kong conquers gives you free spins or you can choose a mystery prize if you would prefer. Great graphics combined with excellent sounds create a fun atmosphere. There is a good coin range from 0.01 to 30.00 per pay line so King Kong video slot is certainly worth a try. 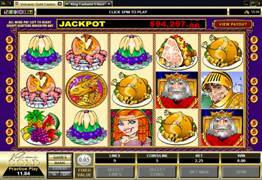 King CashaLot is a 5 Reel Progressive Video Slot from Microgaming. The nice thing about this slot is that it only requires a small bet and you can still win a large progressive jackpot. There is also an added bonus feature where you have 3 choices to take the money or try for a bigger amount. 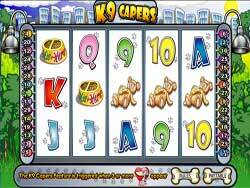 Microgaming’s K9 Capers is a 5 reel 30 pay line slot game reminiscent of the good old fashioned game of hide and seek. The two main characters are FI FI and her male counterpart, Butch, however the one to focus on is definitely Fi Fi. She is the scatter symbol and trigger 2 or more of her anywhere on the reels and you win. The big prize kicks in when you trigger 3 or more of Fi Fi – you are into the Bonus round. Here you will enter a garden where you get 4 chances to help Butch find her hiding place. The fewer attempts the higher the reward – find it on the first attempt and your bet has a multiplier of 100x! You will enjoy playing K9 Capers, this is a video slot that is different and deserves a try.